Having limited space can be daunting especially if you have a large family. With triple bunk beds, you not only utilize your space to its full potential, you also provide more walking room and space for storage. Our range of triple sleeper beds will provide your guests and family with a comfortable space to sleep. In our range below, you will discover many varieties of beds with ladders, trundle, stairs as well as ones with hidden storage. Whether you have up to three kids in the house or want to have extra space for guests, triple bunk beds are a great sleeping option. These beds offer a sleeping space for up to three, whether it is three adults or three kids. 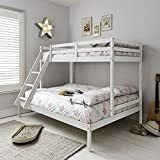 Here at our store we have a variety of great triple bunk beds, some with three individual matttesses included whilst others are just the bunk bed frame only. 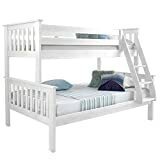 With so many triple bunk beds to choose from, you will be able to find the right one for your home and needs. 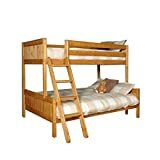 Look through our selections now and choose the perfect triple sleeper bed for your space and budget.